The Romsey Action AGM 2014 took place on Wednesday 29th October in the Jordan Room at Romsey Mill. The guest speaker was Ceri Littlechild, the Mill Road Coordinator, who talked about what she has achieved in her time in the post and its future. The draft minutes and agenda from the meeting are available. Our thanks to all who came along to share their ideas for how Romsey Action can help the community. Thanks to everyone who braved the cold to come along to the Mill Road Exhibition at the Bharat Bhavan on Saturday. Some photos from the event can be seen on the photos page. Localsecrets have also added a report on the day. You are warmly invited to come along to another community exhibition event at Bharat Bhavan on Saturday 18th January. 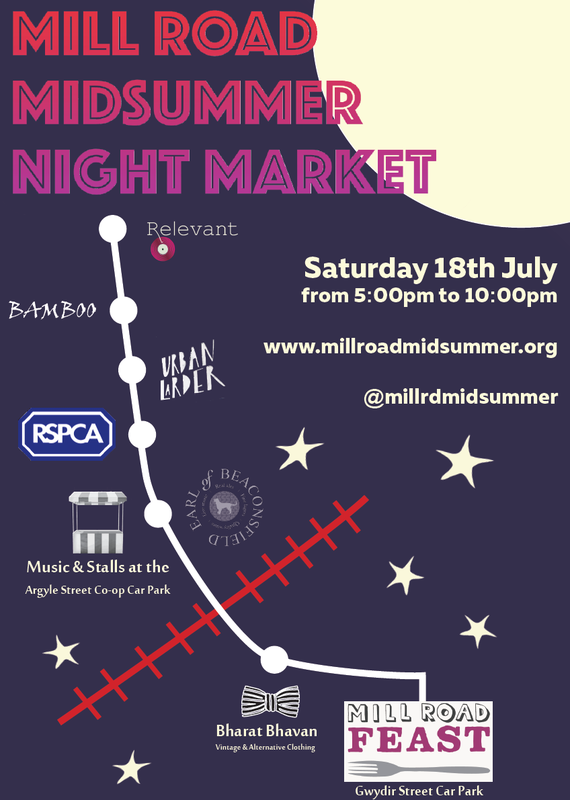 The event is open between 9.00-7.00pm and there will be a Mill Road Bridges networking lunch, music and other fun between 12.30-13.30. The exhibition aims to provide information on local groups such as Mill Road Bridges, Romsey Action and Mill Road History Project, as well as information on local projects, events, concerns and ideas. There will also be a display of suggestions created by Anglia Ruskin business school students for publicity and PR initiatives we could take to help our local traders. Please feel free to come along and see if there's a project you'd like to get involved in, a group you'd like to join, or an issue you'd like to have a say on. 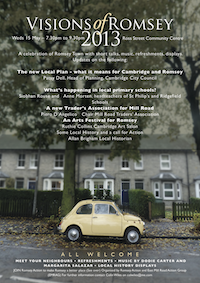 Mill Road Winter Fair 2013 is on this Saturday (7th December) starting at 10:30am. See their website at www.millroadwinterfair.org for full details. Our stall will be in Hope Street Yard and besides giving out information leaflets and trying to recruit new members, we'll be fund-raising by selling SURPRISE BOOKS. This is similar to the surprise film, always such a success at the Cambridge Film Festival. There you buy a ticket without knowing what film you'll get to see. On our stall you'll get the chance to buy a brightly wrapped book labelled with just its genre and its price, for instance, this is a poetry book £1. Live dangerously, take a chance, buy a book sight unseen and support Romsey Action. Actually it's not much of a risk - they are all excellent books donated by the members of the RA committee and they're selling for less than they'd cost in a charity shop. You can buy as many as you want for yourself or for a fun Christmas present. Check us out! A message from Kath Austin about our local charity. During Hospice Care Week, 7-13th October, we welcome everyone to meet the staff from Arthur Rank and learn more about your local hospice. Our information stand will be placed at The Cornerstone Café at St Phillips and staffed at various times during the week. In addition to this we are delighted to present An Evening with Chris Saunders, brother of Dame Cicely Saunders who pioneered Hospice care. This takes place on 10th Oct also at St Phillips and is a unique opportunity to learn more about how Dame Cicely’s work impacted on Arthur Rank Hospice. Everyone is welcome to this free event. Neil has now completed the run, however you can still donate. It's a 52 mile run starting at the lowest lying land position in Great Britain at Holme Fen and taking in 23 'peaks' across the county, to be completed in one day, namely a double marathon on Saturday 19th October 2013. Neil Perry, the director of Romsey Mill, is undertaking the challenge to fund raise and to reflect Romsey Mill's reach across the region and the ways in which it supports young people and families who face daily highs and lows as they struggle to overcome disadvantage and exclusion. Please encourage Neil and donate to this Romsey charity at http://www.justgiving.com/NeilRPerry. The Romsey Action Annual General Meeting 2013 took place in the Jordan Room, Romsey Mill on Wednesday, 9th October. Around 25 people braved the turn of the weather to turn up and discuss the next years activities including 3 councillors. Last years minutes were accepted. The financial report for the last year was presented. A short summary of the years activities was given by Eryl (general), Simon (website) and Colin (Twitter and planning). The current committee were re-elected unopposed. The membership fee has been raised to a minimum of £3/year (waged) and £1/year (unwaged). Donations above this amount are encouraged to ensure that there are enough funds to publicise more events like Visions. 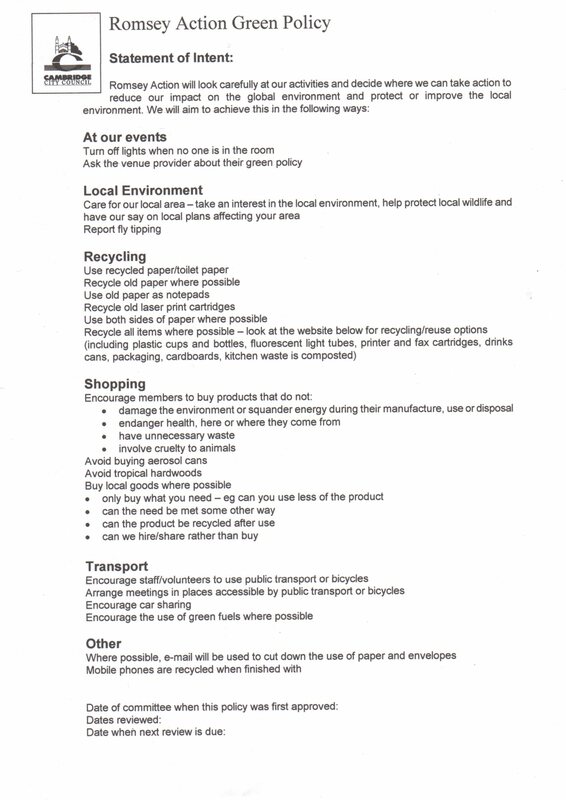 The Green Policy recommended by the City Council and circulated before the meeting is accepted as part of our constitution. Short updates were heard from the Cambridge Lakes project, the Royal Standard appeal and the Mill Road Coordinator. A big thanks to everyone who came along to the meeting. A few photos from the event can be seen on the photos page. The second Romsey photo competition is now open to all until 20th September. Please email any submissions to photos at romseyaction.org. The results of the first Romsey photo competition have now been announced. Congratulations to Cherry Heywood Jones for her winning entry which can be viewed, along with the other entries, on the photos page. Over 100 people attended the Visions of Romsey event in Ross Street Community Centre on the 15th May to hear a wide range of speakers, meet their neighbours and councillors and enjoy free wine and nibbles. 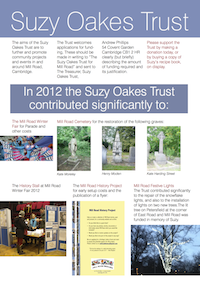 The Suzy Oakes Trust have sent us this flyer reporting on some of the projects that the trust funded in 2012. Information on how to donate to the trust is included on the flyer. Get your Saturday evening off to a splendid start. Everybody welcome whether members of Romsey Action or not. See you Saturday. Note: some pictures from this event are available on the photos page. The draft minutes of the Romsey Action AGM 2012 are now available to read.